Grantland’s Jonah Keri is one of my favorite baseball writers working today. On Wednesday, Keri was on a Southwest flight to Denver. 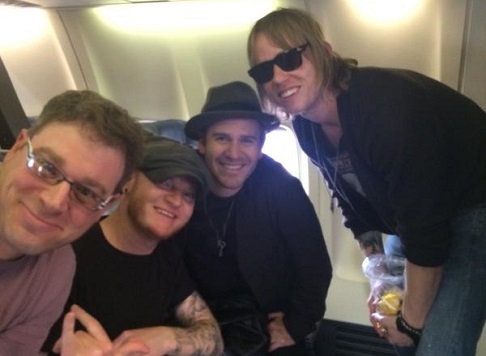 The band Lifehouse was on the same flight. All hell proceeded to break loose. Lifehouse decided to perform an impromptu concert on the flight, complete with microphones and guitars. To illustrate this mess, here’s a pic from the band’s Instagram. Yeah, that would be hell for anyone. But Keri took it harder than most people, and the ensuing half hour long meltdown was a riot. Now, while Keri’s reaction may have been…well, a little intense and played up for the Twitter crowd, imagine the situation. You’re on a flight heading home, and you just want to relax and catch up on some reading. Then out of nowhere, to go along with the cramped conditions, screaming babies, and the other inconveniences of flying, you have to deal with a band you’ve never heard of playing some live music. Well, when I put it that way, maybe Keri didn’t go far *enough* with his tweet barrage. Yes, Jonah suffered on this flight, but he at least he managed to amuse us all while doing so. Thank you.